LONDON BRIDGE station has been ceremonially opened by Prince William, to mark the conclusion of a £1 billion upgrade which has taken five years complete. 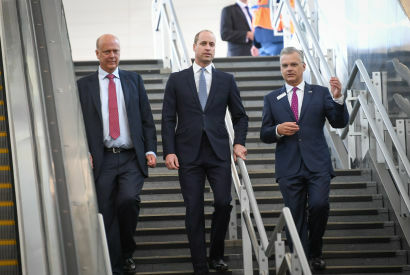 The Prince arrived by train and was greeted by transport secretary Chris Grayling, Network Rail chief executive Mark Carne and Network Rail’s programme director for Thameslink, Simon Blanchflower. Prince William unveiled a plaque at the station, which has been completely rebuilt with a much larger concourse. All 15 platforms were also upgraded as part of the scheme. Transport secretary Chris Grayling said: ““Today, we are indebted to the thousands of men and women who have built a modern, accessible and iconic station fit for London’s future, and the patience of passengers who will now see a transformation in their journeys. Network Rail chief executive Mark Carne added: “This station has been rebuilt from its Victorian foundations upwards by a team of engineers while still providing a service for the 48 million people who use the station every year to deliver it on the very day we said we would five years ago.